About a year ago I made my first serious move into using filters in my photography. At that point the furthest I had gone down that route was a few cheap screw in circular polarisers, ND8’s and UV filters, which were fine for what they were but the more I read about filters and seen what other people were doing with them the more I wanted to stick a toe in this whole new world of photography. Cost was an issue, isn’t it always, so I lowered expectations and bypassed the pro systems like Lee or Cokin Z and stated to look at a P series system, the 85mm slot in filter range. This seemed perfect as the filters were reasonably priced and there was a huge range to choose from. After some initial research I discounted Cokin’s range of ND filters as they got a terrible feedback online with dozens of complaints of purple colour casts on shots taken with the Cokin ND’s. Eventually I settled on Formatt Filters Hitech range which seemed to be a decent alternative and bought a set of 0.3. 0.6 and 0.9 ND filters and a set of 0.3, 0.6 and 0.9 ND soft grad filters. Throw in a P series holder and a 77mm and 67mm adapter ring and I was no more than £75 out of pocket for a basic setup. I quickly also added a Kood 85mm slot in circular polariser to this line-up and for just under £100 I was ready to go. The journey though, was a rough one. I learned a lot about filters and found that Hitech filters did indeed colour cast, especially with more than 2 stacked together. A 0.9 on its own was fine. A 0.9 soft grad on its own was fine. Stack the 2 and purple skies all round. At this point I nearly gave up, disheartened by the new purchases as they seemed to be a step back rather than the step forward I had hoped for. In this situation, rather than throw in the towel it’s better to try and understand what is actually happening and how you can best avoid it. To this ends I started to see which conditions the filters worked best in and also figured out how to remove the worst of the cast in Photoshop so it was less of an issue. I soon stated using them all the time and was getting some reasonable results. By this time I had added a cheap sunset grad, Kood red soft grad, Kood light tobacco soft grad and a Cokin 81A warm up filter to the collection and found that each of them worked best in certain situations. It took a lot of trial and error but once the understanding was there it made the frustration a lot less. Once you understand that in the middle of the day a red grad will give a shocking false image and used on a sunset it will work nicely you can really move on! The next step was delving into long exposure photography. Initially I done this by stacking a screw in ND8, first then attaching the p series holder fitted with the Hitech 0.9 ND, 0.9 ND soft grad and 0.6 ND soft grad. Colour casting was horrific but I was able to get exposures up to long enough to streak clouds and flat out water, although the shots could only be used as mono conversions. The solution to this was to invest in a proper 10 stop filter. Some research suggested that screw in types were best as they avoided light leak so I attempted to get a B+W ND110, which was the first time I came up against the difficulty in getting good filters. These were nowhere to be found, most places were quoting 6-12 week lead times which were no good to me, I wanted it now! Another quick Google and it seemed that the Heliopan ND3.0 was as good as the B+W and luckily, there was a stack of new 77mm versions on EBay at £95 a go. Cheaper than the B+W but even better, available now. The Heliopan changed everything. Long exposures with no cast were now possible. Even stacking one 0.9 grad in some situations was possible but it still gave horrible casts from time to time. Not the Heliopan, it was perfect but the Hitech was no doubt the cause of the problem. This got so frustrating I ended up buying the Lee filters foundation kit with intent to move to Lee filters, no matter what the cost. I got the holder at a decent price and it lay there unused as I had no 100mm filters for weeks on end. The problem this time was the lack of Lee filters anywhere. There are just none for sale, or at least for delivery this side of Christmas it seems. Some places are quoting 16 week + lead times for any Lee resin filters and as a result of this the 2nd hand market for them is nuts. 2nd hand Lee grads are going for silly money with this shortage and the “Big Stopper” even worse! 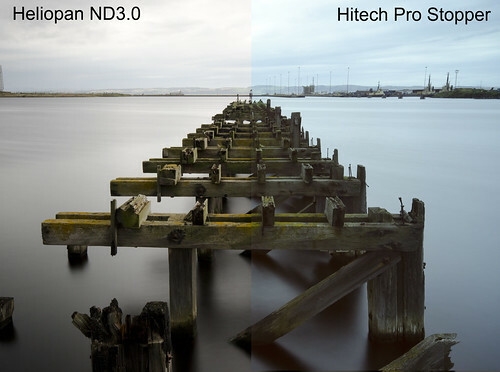 Eventually out of frustration I looked again at Hitech filters. Some recent blog comment seemed to suggest that the company had a new resin it was using and the results were near comparable with Lee filters for a fraction of the cost. This was based mainly around the Hitech equivalent to the Lee Big Stopper but there was also a new range of 100x150mm Hitech filters. A quick search on eBay shows these filters going for around £40-£55 but in one of these rare moments where you get an actual bargain on eBay I found individual 0.6 and 0.9 soft grads for sale, made an offer and now own both for less than the cost of a single filter from some of the other sellers, both brand new and unmarked! A quick test with these in conditions I would have normally expected to see colour cast produced no colour cast at all. Even a 30s exposure in tandem with the Heliopan 10 stopper produced no cast which is an encouraging start. Over the course of the next few weeks I’ll try these in a variety of ways and conditions and report back what the overall impression is. If it’s good then an investment in a Hitech 0.9 reverse grad may well be in order and I’ll have to possibly consider the new version Hitech ND3.0 as well. The screw in Heliopan is a terrific filter but screw in and out in cumbersome if you need to recompose. A slot in option might well be handy but only if it performs as well. I’m not discounting a switch to Lee in the future but for now while there is no availability there’s nothing to lose in trying the Hitechs, if nothing else it’s letting me use that nice new Lee filter holder at last! 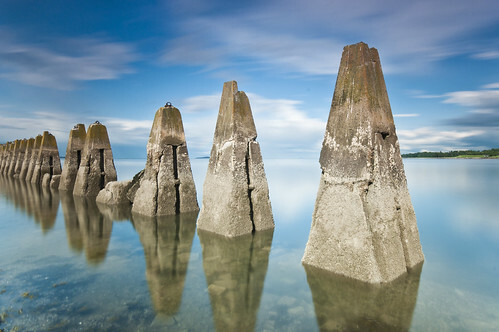 For a fair few months now I’ve harboured a desire to capture the causeway to Cramond Island, on the outskirts of Edinburgh as the tide was just going out. 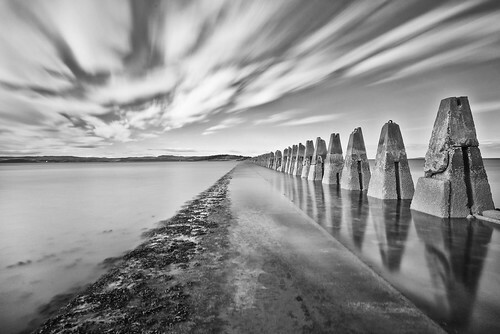 If you’re not familiar with the location, from the esplanade there is a raised walkway that the tide never covers for maybe around 200ft, then at the end is a set of small steps and then you’re down on the lower level of the causeway where a half mile walk or so will take you over to Cramond Island at low tide. 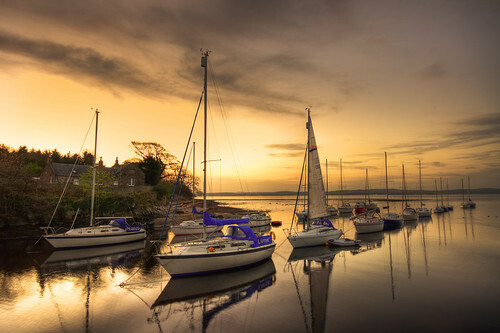 Now, I’ve photographed Cramond MANY times and it’s distinctive causeway too many times to count. 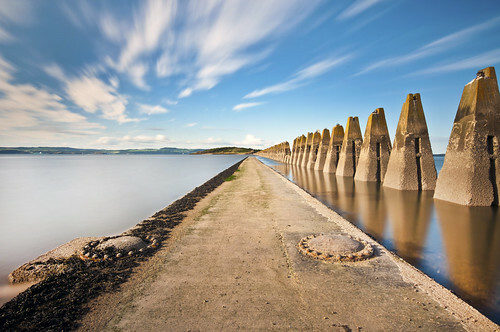 The causeway itself it lined with a set of old WWII sea defences which were designed to stop small boat attacks further up river at the Forth Bridge and Rosyth Naval Yard, the other side of the island to Fife was protected by anti submarine nets. All that remains now is the distinctive line of pyramid structures right out to the island which get covered more or less to within a couple of feet from the top at high tide. 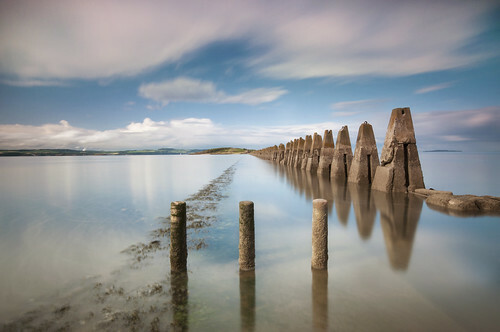 The challenge though, was the photograph the tide as it came in over the causeway. It’s fairly safe to do so as long as you keep your wits about you. You need to be on the causeway itself around 3 hours before the high tide time. If you get there early the water will start to flood the sand flats either side and sit around the bases of the sea defences. You need not go to far out to get a load of interesting shots of the defences. However, soon you will see the water start to gently spill over onto the causeway about half way along. If it’s between you and the mainland, get back quick. If not keep and eye on it and you can move up a bit and you’ll have plenty time before it reaches you. From the first signs of water on the causeway to needing to get off it you’ll get around 30 minutes. As it starts to properly flood you need to be up near the elevated section of the causeway where you can make a sharp exit to safety. Remember, the water gets around 8ft deep here at high tide. Get yourself up near the steps and you’ll have plenty time to rattle of shots of the tide as it advances towards you. It’s a perfect place for long exposure shots especially. Just keep an eye on the water as it comes in very fast and once it starts to reach your feet it’ll be a few inches deep in minutes. Get it right and you get these sort of shots. Around 5 minutes before the tide will arrive at your feet! Get your timings right and it’s well worth a visit. Even after you need to get up on the elevated section it’s still worth hanging about as there’s still interesting shots to be hand from up here. What a week it’s been for the old sunset shots! It also helps that sunset is at a hospitable time at the moment too. Setting around 8.40 is much preferable to being out and about at the back of 10 or worse still, being sat in work watching the sun give a great visual display on the horizon! 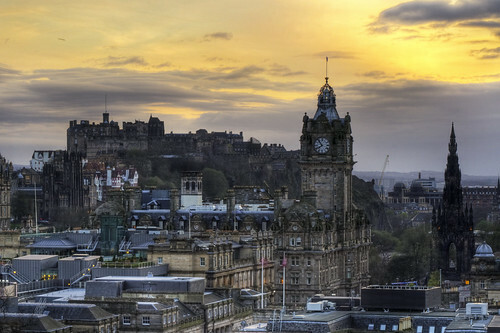 My last post gave you whole tale of how I managed to get my favourite sunset shot of the year so far, but as I can see from my Flickr photostream, April tends to be a particularly good month for sunset shots around Edinburgh for some reason. This was last night’s effort. The original plan had been to head down to the Cramond Island causeway, but since I’ve done that to death I headed down to West Shore Road instead to a spot further along the coast I spotted the other night which had a perfect view of the causeway, Cramond Island and the Forth Bridges behind. To say this was a difficult shot to take would be an understatement. The sun was still high in the sky, actually just above the top of the shot. With the distance I switched to the Sigma 70-200mm f2.8 EX HSM for a bit of extra reach but actually expected it to give me horrible lens flares, which surprisingly, it didn’t. 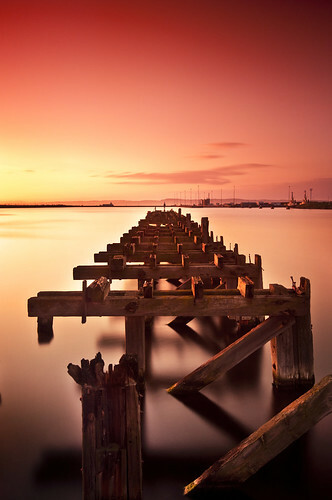 Once again, I framed up the shot with no filters, locked up the tripod and slipped on the now invaluable Heliopan ND3.0 10 stopper, the result was a pleasing enough shot with a nice gentle orange glow in the sky but it left the water a touch dull. To combat this I slipped on the adapter ring and filter holder and slipped in the sunset filter. With this in place I could stretch the exposure out to a full 60s, after a couple of goes at setting the grad this was the final result. It took a fair bit of post process if I’m honest as shooting into the sun had brought out every single dust mark on the sunset filter, of which there were many! There was also a bit of flare I’m managed to just about eridacate with a little dodge and burn. If I were to try this again I think I’d try shading the filters to try and get rid of the flare from the shot in the first place. The night before though also produced a surprise shot for me. With the position of the sun and ideally wanting to get it over water the Western Harbour at the back of Ocean Terminal is a great spot. 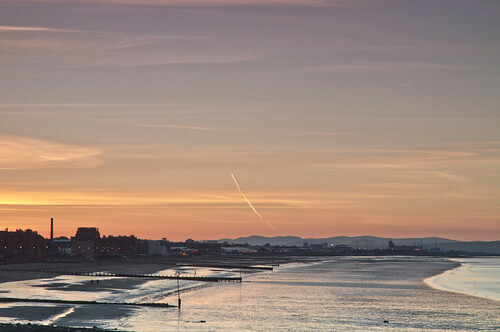 The obvious shot is the old pier with the Gormley statue at the end of it, but the flats at the other side of the harbour make for a good shot too, especially if the water is still. However, it was the pier that produced the goods. I’ve shot this before on long exposure and had a lot of issues with light bouncing back into the lens from the filters and I finally figured out why. At this location there is a shiny bare metal fence which I sit the tripod up against to get the shot, the light has been bouncing off the metal and back up into the bottom of the filters and I effectively get a reflection of the inside of the lens on the shot, just putting an arm along the fence was enough to get rid of this totally, amazing what you can figure out. Again with this shot, I set up the shot without the 10 stopper in place, played with the filters to see which combination worked best and then screwed in the ND3.0 and slipped the other filters back on top. 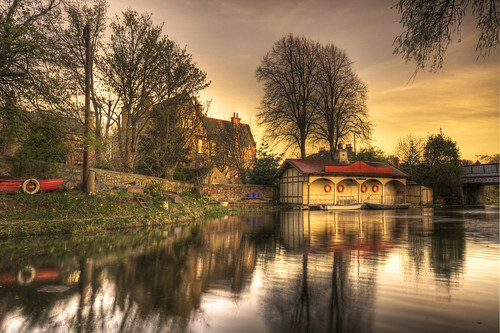 In this case, I’ve used the ND3.0, circular polariser, ND0.9 soft grad and sunset grad filter on a 3 minute exposure to get the colour and effect on the water. The sun was still in the sky off up to the left of this shot. That’s the more recent shots but like I already said, April is a good month for sunsets so here’s some of the month’s other highlights! It’s not often I drop a new blog post about a single shot but I liked this one so much I thought it worthy of a little write up. As you will see if you follow back my recent posts I’ve been experimenting with long exposure photography over the last few weeks, in fact, it’s becoming more of an obsession than an experiment. What I have had bother with though, is getting decent colour into shots, hence why my Flickr Photostream has gone rather monotone of late. Stacking those Hitech ND soft grads is just a sure-fire route to a purple colour cast on the D90, which is pretty undesirable to say the least. However, last night everything just fell nicely into place and I ended up with, what has to be, may favourite shot of the year so far. The original plan had been to catch the sunset at Longniddry over the rocks but other things I had to do put paid to that and I would have only made Longniddry just before the sun went down which would have been ok if I was more familiar with the location. 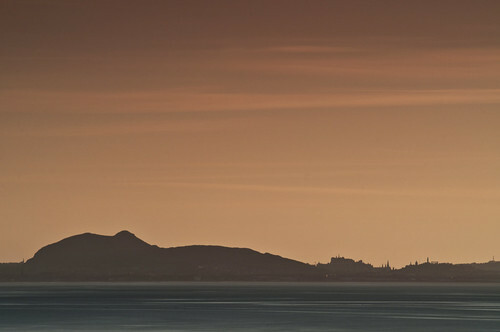 As I’m not I diverted back up the Edinburgh coast with the intent to catch the sunset over the Western Harbour. 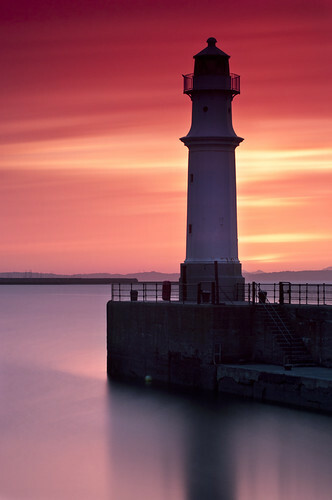 However, since the shows are at Ocean Terminal just now and the place was overran with walking JD sports adverts with attitudes I headed for the more peaceful refuge of Newhaven Harbour instead. 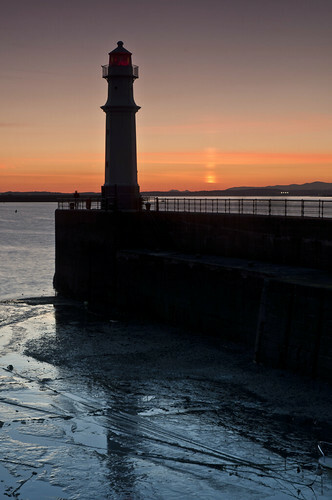 I really didn’t want to be at Newhaven having really photographed the place to death over the last few weeks. Its easy location and multiple shot possibilities make it and attractive location but it’s fast becoming my new Colton Hill, somewhere I’ve visited so often I get bored of it. 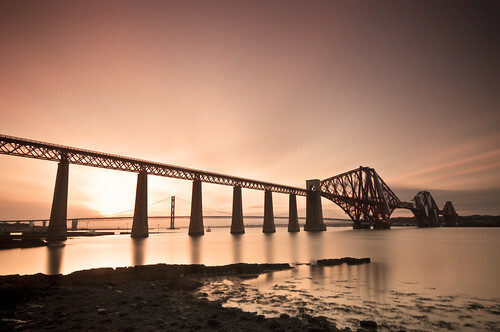 With the sun setting though, it was Newhaven or nothing and apart from anything else, at this time of year bar the Forth Bridges, it’s probably the best sunset location in Edinburgh. Sunset was still about 25 minutes away when I got there so I originally setup with the Sigma 10-20mm on the D90 and took a few tester shots using the grads and polariser but no 10 stopper. 10 stoppers are only any good in harbours if the tide is out, with it in boats tend to bob about and blurred boats do not good pictures make. With the sun and the available light dropping fast I moved position to put the sun behind the lighthouse to avoid any lens flares and replaced the ultra wide with the Sigma 70-200mm f2.8 EX HSM, my absolute favourite lens. 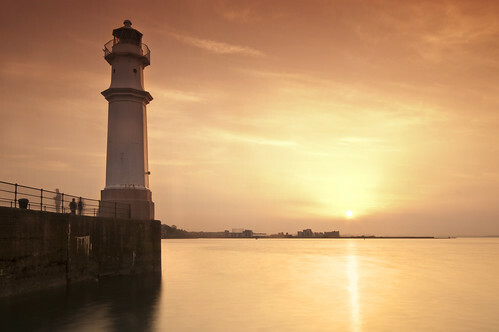 This let me frame the lighthouse and harbour wall nicely but avoid any boats in the shot. 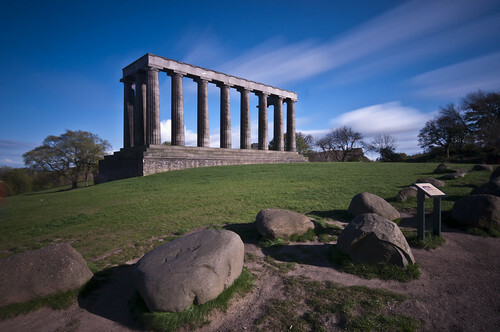 I then added the 77m filter ring and slipped in the polariser, ND 0.9 soft grad and tried a few test shots. I also experimented with a light tobacco grad and sunset filter but it was the red grad, a filter I’ve never used as I hated the results that was producing the goods. With the grads set properly, I locked the tripod securely and removed the filter holder and put it down on the camera bag careful making sure the grads didn’t move. I removed the 77mm ring and fitted the Heliopan 77mm ND3.0 10 stopper, fitted the 77mm ring to that and carefully slotted in the holder with the grads. I had to do it this was as with the 10 stopper fitted there was no way to line up the red grad on the horizon as you can’t see anything. With light fading fast I upped the ISO to 200 and opened the aperture up to f8 and went for a 2 minute exposure which was ok but the red was too intense. I tried again upping the exposure to 3 minutes which turned out perfect. As far as post process work went, there wasn’t a lot to do, the pleasures of getting it more or less right in camera. I created a new adjustment layer and increased the exposure to lighten the inside harbour walls and bring out some detail. I then erased all but the harbour walls from the layer. I then added a new photo filter layer to intensify the colour in the water, other than that, that’s about all I had to do with this one. Thankfully the sensor clean I attempted the day before must have been spot on as there was nothing needed cloned out at all. A welcome surprise. Well, I finally got my hands on a 10 stop filter. Not the B+W I had originally hoped to get, they seem to be rather hard to get hold of just now in the UK, but a Heliopan ND3.0. After a little bit of research it seems that this filter is rated as highly as the B+W so when TeamworkPhoto on Ebay put a stack up for sale at a slightly lower price than the B+W versions a sale was inevitable. At a touch under £100 for a 77mm version it might seem expensive for a little bit of round glass but it’s when you start to use these things you can see the quality and exactly what your paying for. This particular filter is the slim version so it fits nicely onto my Sigma 10-20mm lens and I can attached the 77mm p series adapter ring to it to allow me to use the CPL and grads easily too. The lens is usable at around 12mm upwards otherwise you do start to photograph the edges of the filter holder, which isn’t too bad as even without the 10 stop in place you get this same effect at around 11.5mm so no great hardship there. First thing I noticed and it’s fairly obvious really, you simply cannot see a thing through this filter. It’s that dark. Hold it into very bright light, i.e. into the sun and you could just about compose a shot but with grads and a CPL in place as well, not a hope. This means the shot has to be composed on the tripod (obviously); the head locked in place and then carefully fit the 10 stopper and slip the filter holder with the grads on. Bit fiddly but you won’t be taking that many shots with this arrangement in place since you’re likely to be playing around in the 3 minutes exposure mark. This was the first attempt with the 10 stopper. 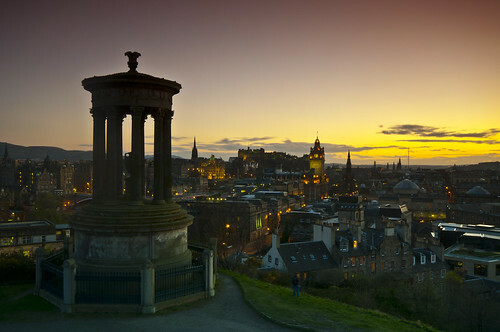 Taken on Calton Hill in Edinburgh, just the 10 stop and CPL in place. VERY bright light, around 5pm with a clear blue sky and, unusually for Scotland, a nice bright sun. 3 minute exposure and it’s nicely done the trick I wanted and got rid of all the tourists walking about in front of the monument, which was sheer luck not of them stood still long enough to get into the shot. I did have another attempt later the same day at Newhaven Harbour and got some cracking results but the sea was rough, the wind was terrible and the grads were picking up spray all over and the shots were frankly unusable as a result. Lesson learned there. 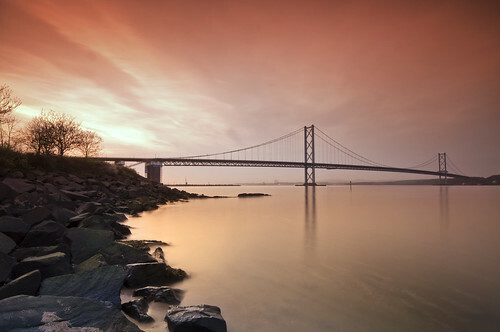 Next night out was the Forth Bridges. A very familiar subject so a good place to test the filter out. I started around 7.20pm, approx an hour before sunset with the tide coming in and the sun still quite high above the Road Bridge. 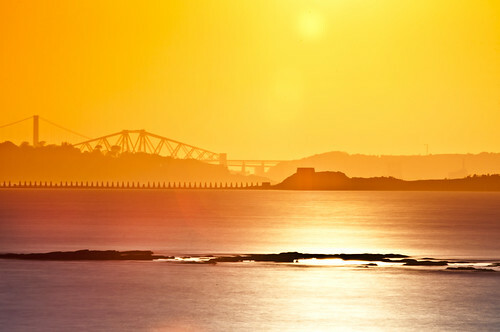 It seemed pointless to go shooting into the sun so I took a shot of the rail bridge with the rocks in the foreground getting covered by the incoming tide. 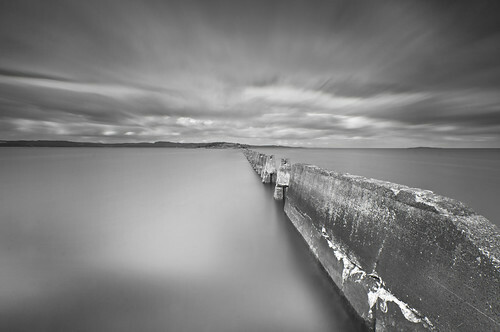 This was a 4 minute exposure with the CPL and Hitech 0.6 ND soft grad. Very impressed at the lack of colour cast from the grad with the 10 stopper, at least if your not looking into the sun with it. As the sun went further down I moved to the other side of the rail bridge to get the sunset with both bridges in the shot. 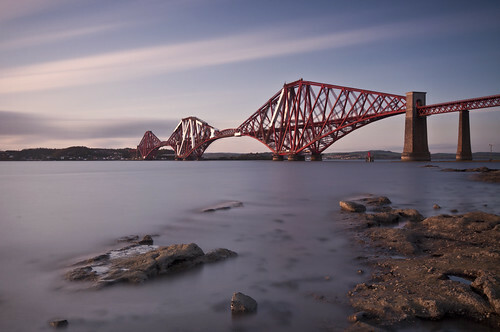 A popular spot for photographers and sadly, the ned element of South Queensferry too it seems. This was the last of my 10 stop shots for the night as exposure times were getting way too long with the decreasing light. This was a 331s exposure with the 10 stopper, CPL, ND0.6 soft grad and a light tobacco grad, ISO200 f11. I have to say I’m enjoying the learning process with this new filter although my usual hit and miss method of calculating exposure times is going to get very tiring very fast. To that ends I’ve found an iPhone app called Long Time that does the calculation for you which I’ll give a trial of next time I’m out which will hopefully see the end of hit and miss results guessing exposure times.